WHAT IS JAPANESE KNOTWEED AND HOW DOES IT AFFECT YOU? Japanese knotweed is a highly invasive, persistent, non-native plant which can grow through tar, masonry and even concrete, causing significant damage to property. 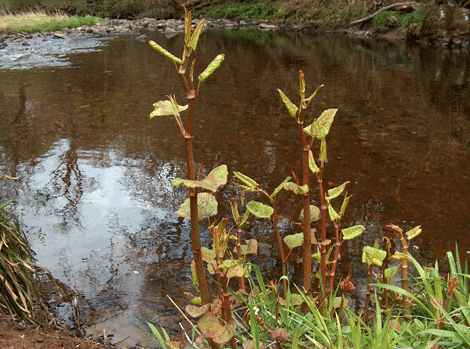 Japanese knotweed can also block drains and watercourses resulting in flooding. 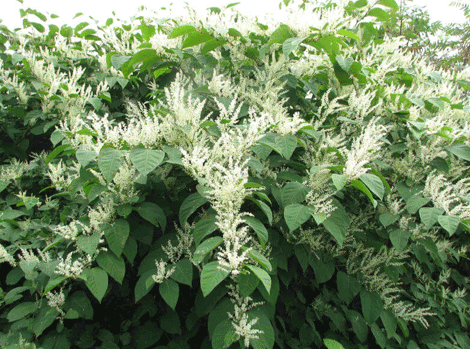 Most insurers will not cover any damage caused by Japanese knotweed so if you have this plant on or near your property and you wish to sell, or borrow against it, you will be required to take action. It is a criminal offence to grow or cause the growth of this plant under the Wildlife and Countryside (Scotland) Act 1981. 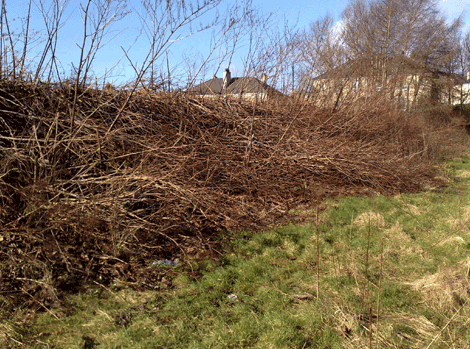 The management and eradication of Japanese knotweed requires specialist knowledge. This ornamental plant, a member of the dock family (Polygonaceae), can reach 2-3 metres in height when fully grown. Dense bamboo-like stalks form crowns when the plant growth is established, these clumps are known as ‘stands’. From these main stalks, arching stems grow which produce alternating heart shaped leaves. New growth commences in the spring, usually between February and April, when red buds emerge from the crown of the plant which quickly grow into reddish shoots. Green leaves unfurl from the stalks as they grow to full height by early summer. Late in the growing season, August to October, the plant flowers comprising small fronds of creamy white flowers which hang down from the leaf axils. After flowering, the plant enters senescence where it dies back for the winter. Stems often dry out resulting in brown bamboo-like canes which may stay erect for several years before decaying. Japanese knotweed develops an extensive network of underground roots called rhizomes. Rhizomes tend to grow laterally, spreading out from the crown of the plant; lateral extension can reach 7 metres from the parent plant and achieve a depth of 3 metres. The actual distance that rhizome extends from the crown does vary considerably depending on the growing conditions. The outer surface of rhizome is dark brown in appearance. If fresh, it snaps easily like a carrot to reveal a bright orange inner with a different shaded core. 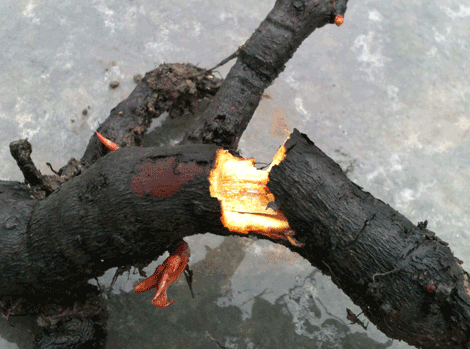 Older rhizome can be very woody and may have a hollow centre with an orange to cream outer ring. 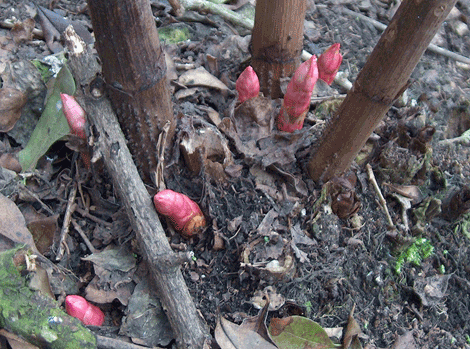 Reddish pink buds and white hair-like, roots are found along the rhizome during the growing season. New rhizome growth is white and very brittle. It can be difficult to accurately identify Japanese Knotweed once it has died back during the winter months, often the plant looks similar to other garden plants and weeds. Incomplete herbicide treatments can be difficult to identify. 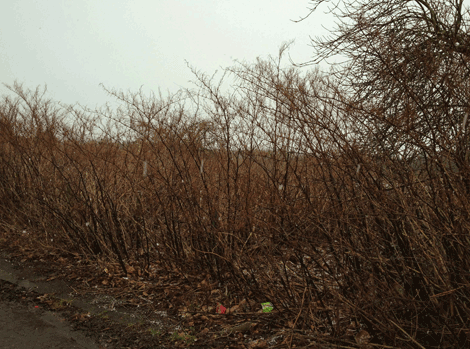 If a site or area has had the surface scraped or covered it may still be possible to identify Japanese Knotweed. 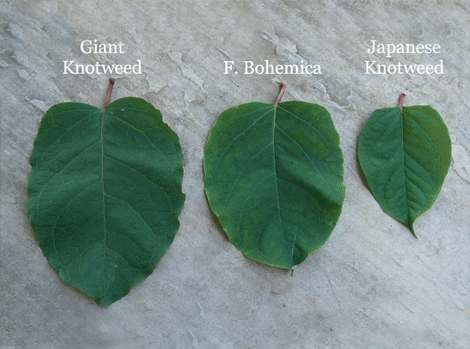 There are a number of variations and hybrids of the common Japanese knotweed (Fallopia japonica) which include Giant knotweed (Fallopia sachalinesis) and a hybrid of these 2 varieties which is known as Fallopia x bohemica. A similar member of the Polygonaceae family is Himalayan knotweed which has more elongated leaves. In order to achieve best practice all varieties should be managed in the same way. Japanese knotweed seeds are generally sterile and the plant regenerates by new growth from plant or root (rhizome) fragments, the plant is known to be vegetative. Rhizome fragments smaller than a fingernail can regenerate into a new plant and these are very easily spread. Fragments of Japanese knotweed are often accidentally spread by disturbing or moving infested soils or even by mowing vegetation. 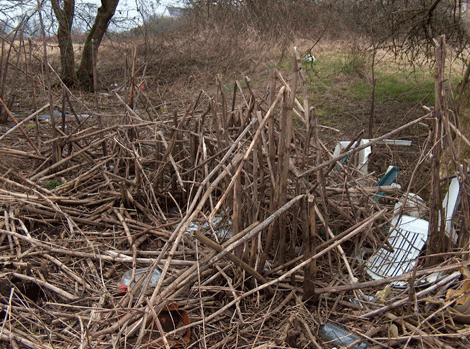 Plant fragments can also be carried along watercourses to be later washed up onto downstream banks. 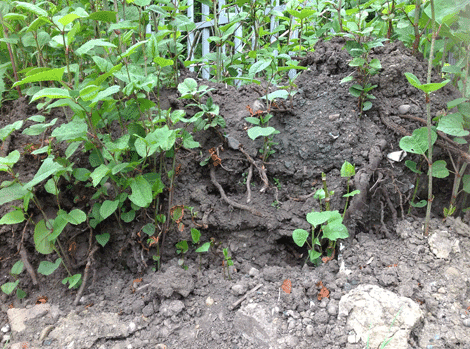 Imported soils should always be checked for Japanese knotweed rhizome. It is commonly known that Japanese knotweed becomes dormant in the winter months however it can also become dormant when being treated with herbicides. Rhizomes can remain dormant for many years (up to 25 years) only to re-emerge. Japanese knotweed plant material, rhizome and any soils containing parts of this matter are controlled by the following legislation. The Environment Agency’s Knotweed Code of Practice provides guidance for management, identification and permitted disposal of Japanese knotweed.